Spacious expanded Fairway Resort plan on large greenbelt near pool & spa. Fabulous views of Eastern mountains for gorgeous sunrises. This plan has 3 private ensuite bedrooms with walk-in closets. Each has its own patio area. Hunter Douglas window coverings. Great Room with fire & ice fireplace, atrium den with skylight and large open kitchen with two skylights and adjacent dining area. Private laundry room & pantry closet with attached oversize 2-car garage and large golf cart garage. Interlocking paver patio entry and driveway area. Desert landscaping is maintained by HOA. The Eastern side of the home has been expanded with large office area and Murphy bed off master suite. Offered furnished per inventory. HOA covers roof, painting & landscaping. New roof in 2019. This freestanding Skyview home went through a complete remodel in 2017, creating an ideal indoor-outdoor entertaining space. The expansive walled patio garden with mountain views provides more than 1000 SF of private outdoor living, dining and entertaining. The remodel features all new appliances, handmade turkish tile backsplash, a complete open floor plan, a large glass and mirror wet bar, large screen TV, Travertine floor tiles in Versailles pattern and Ledgestone floor to ceiling fireplace. Art lights in the vaulted ceiling create a gallery mood and the expanded office provides a perfect art studio. Large master bedroom with fully remodeled bath with large shower and second bedroom with en suite.Located in Ironwood CC. Amazing Golf and Mountain Views! A charming paver tiled courtyard leads into a tiled entry. The kitchen has light Modern decor with quartz slab counters, new white cabinetry and opens to the living area. Vaulted ceilings, recess lighting and tile though out highlight the living area. There are 3 private suites. From the patio the views are spectacular looking down the fairway at the elevated green with the gorgeous mountains in the backdrop. Furnished Per Inventory. Sleek and modern, this contemporary condominium is stunning. 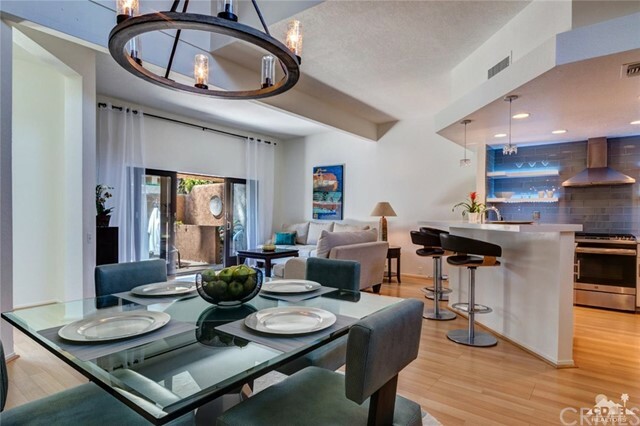 Extensively remodeled, with incredible southern mountain views, this beautiful two-bedroom, three-bathroom corner unit, has a private courtyard with spa, and two private decks. The kitchen has been extended out with white quartz countertops to provide a larger counter area for entertaining. The beautiful gray glass tile is accented with lighting underneath the custom-built shelves. The powder room has a stunning blue glass counter and sink and high end tile. On the second floor, the spacious master bedroom is light and bright with direct access to one of the two private decks. The roomy master bathroom features porcelain tile flooring and a large shower. The large guest bedroom has an ensuite bathroom. Attached two-car garage. 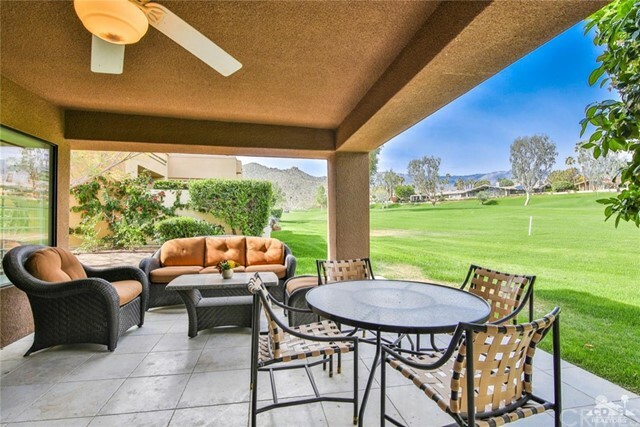 Located within the popular Ironwood Country Club, this unit is situated on an expansive greenbelt and is conveniently located a short distance to the tennis courts. Largest Freestanding Skyview Plan with 3 bedrooms and 3 baths. Located in a cul-de-sac setting with large greenbelt near pool & spa. Oversize double garage. Living/dining room has fireplace. Kitchen has dining area and ample storage including hallway closet that could be pantry. Master bedroom has large bath with tub and shower plus walk-in closet and wardrobe closet. Guest suite has private bath and patio and 3rd bedroom has adjacent hallway bath with tub/shower. Lots of potential. This property is well-maintained in original condition. Furnished per inventory. 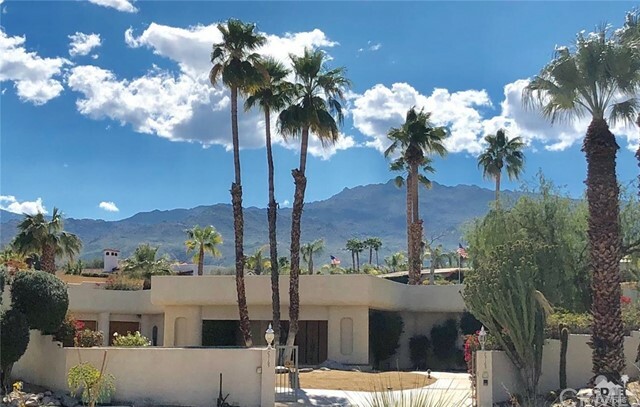 Golf Course and Mountain Views in Ironwood Country Club! This Freestanding condo has been remodeled and has 2 bedrooms and 2 baths plus a large den that can convert to a 3rd bedroom. The 2 patios have been expanded to capture the beautiful surroundings of this special retreat! A must see!!! Wow! Come make this prestigious Ironwood CC home your very own masterpiece. You know you have arrived when you drive up to this impressive circle driveway with covered entry. The open floorpan makes for an easy remodel and skylights through out make it light & bright. The kitchen is large with sub-zero refrigerator & double oven. This home was built for entertaining from the recently remodeled saline pool & spa with swim up bar, pebble tec and marble finish. Completing the outdoor area is a kitchen area, pool house with bathroom, sauna & shower area. Versailles set Travertine Stone floors are through out. The master bathroom has his & hers separate showers makeup area, builtins, under counter lighting, you can virtually get lost in it. The home has two separate living areas with three air conditioners. It is a must see to appreciate all it has to offer. Mountain Views! Stunning Contemporary Remodel! South Palm Desert! 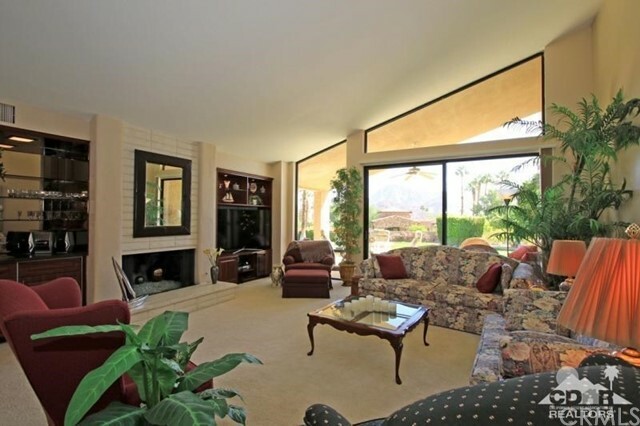 Ironwood Country Club !Two bedroom two bath with high ceilings and large rooms. The contemporary remodeled home has been updated with designer entry doors, tile floors along with upgraded lighting. The great room with decorative fireplace offers the best in entertainment. 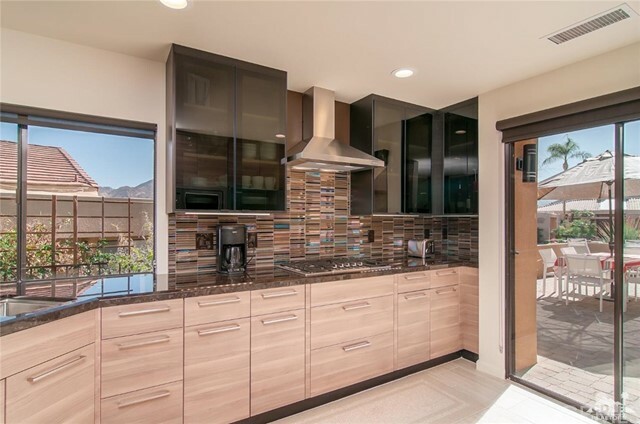 The kitchen is a chef's delight with cohiba granite counter tops & backsplash imported from Spain. Front oversized deck with spectacular mountain views and lots of room to entertain. No detail was missed in this superb contemporary modern home offered furnished. 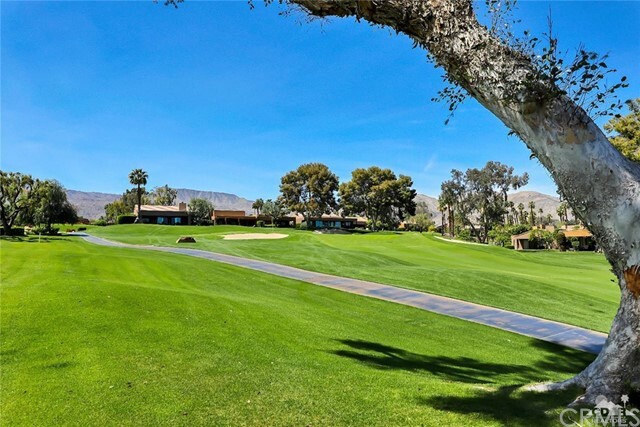 Ironwood Country Club located in Palm Desert is near El Paseo that offers world class shopping and restaurants. A member owned club Ironwood includes two golf courses, fitness center & spa, tennis & pickle ball facilities. HOA includes Cable, Wi-Fi, 24-hour security guard gated security, community pools and spas!